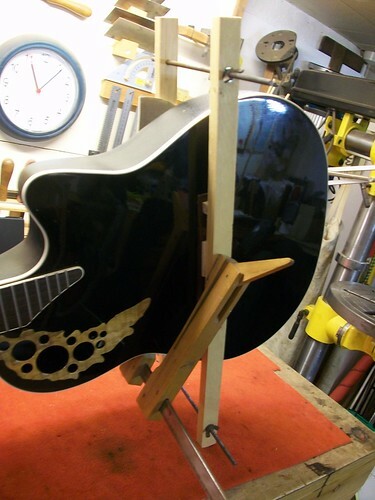 This Ovation LX was in serious trouble when its bridge lifted off. It is only a couple of years old and was shipped over from Germany. 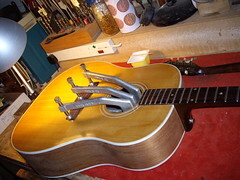 It had had intensive repair in the past and the bridge had been refitted (twice) by guitar techs in Germany. 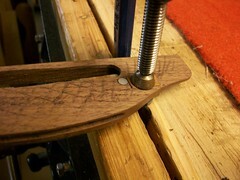 Normally when gluing a bridge in place, bridge clamps are used. 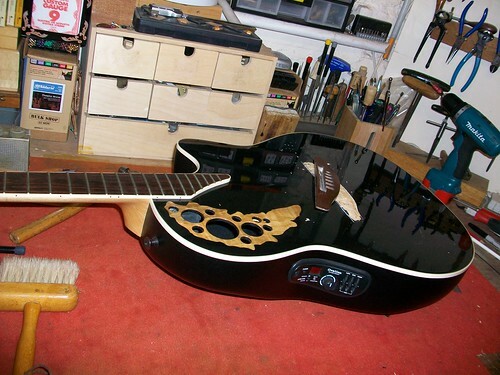 Since the Ovation LX does not have a sound-hole in the traditional sense, a different gluing method must be used. It was decided that the bridge should be glued back in place using very strong wood glue and also bolted down through its wings. This would ensure that the wings of the bridge are tightly clamped whilst the glue was drying. The heads of the bolts would be covered with 6mm Mother of Pearl dot inlays to disguise their heads (a common solution). When gluing a bridge to its soundboard appropriate down-baring from the clamps to the bridge is vital if it is to remain permanently stuck. I suspect that this was not the case with the past two attempts. I decided to use a purpose made bar clamp. 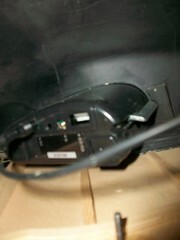 This clamp is used to “sandwich” the bridge, soundboard and back together. 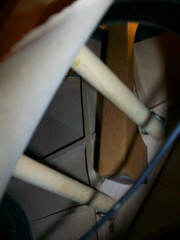 Care must be taken that the soundboard and the back of the guitar is not deformed in any way when using his clamp. 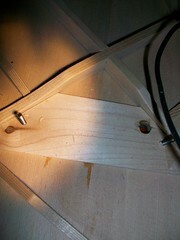 To eliminate this, dowel posts were made and used to support and oppose the downward baring of the bar clamp on the soundboard and distortional forces on the back. Also just as added insurance a cam clamp was used. 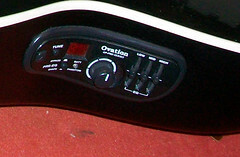 The pre-amp of an Ovation is set into its side. This entire system was removed thus creating an opening in the side where the cam clamp can be inserted and used to reach the bridge and bridge-plate. The soundboard and bridge were cleaned up. On the underside of the bridge ply-wood patches were inlayed to stiffen up this area and prevent the bolts from pulling through the bottom of the bridge. 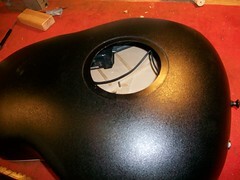 The glue was applied and left to set for 12 hours. 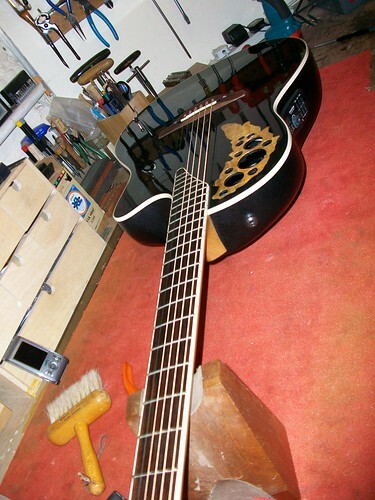 The guitar was strung up with 12 – 54 strings and tested for several days.